Will Oremus, senior technology writer at Slate, reports that, "Silicon Valley Has Officially Run Out of Ideas." 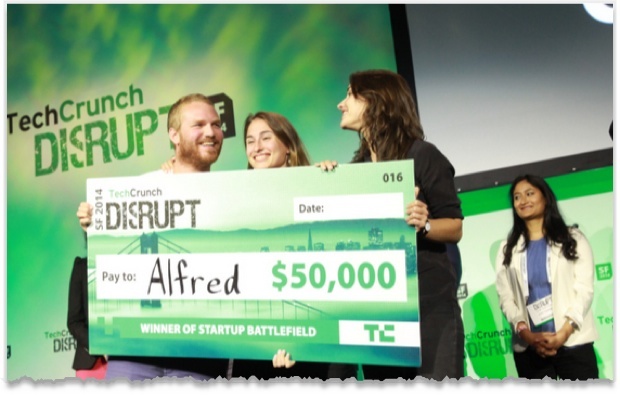 Because the recent TechCrunch Disrupt conference in San Francisco, awarded Alfred, the top prize in its competition for startups. I was unable to find a precise English translation for that sentence, but I have to agree with ValleyWag’s Nitasha Tiku: It sounds an awful lot like a butler service. However, I do agree that Silicon Valley seem to have run out of original ideas. How many To Do lists, email management, or calendar apps do we need? There's dozens of me-too startups in many categories. Like early Bitcoins, the easy ideas have been mined and new ideas are becoming difficult to produce. What doesn't help is that Silicon Valley techies are coddled and segregated by their employers. They get on the company bus in the morning and spend all day inside the company, eating for free at the company canteen, using free company services from the company store, plus a company haircut and company massage. It never used to be cool to be a company man or woman but it is today and conformity is the company way. But it means they have very little experience of the world outside of their company. How will engineers come up with great business ideas that solve common problems that many people face every day if their every day is the same — a techie version of Groundhog Day? If I ran Google, Facebook, etc, I'd make sure to garage the buses and shutter the canteens at least one day a week, to see if my staff can figure out how to get to work on time, how to feed themselves, and how to clean their own apartment. They might come up with some interesting ideas. Original ideas need original experiences and San Francisco has a treasure trove of experiences to offer. But tech workers need to get off the bus and think outside of the company.